Started a game on middleburg. Got to the top of the hill then this happened. You may note that I had no hands on the screen. My tsnk was just spinning in place for 30 seconds plus until I closed out the app and restarted. I was able to return to the gsme and finish the game without incident. I'm guessing your teammate 54 got smeared by the time you got back. I would say ping spike, but that number looks ok.
That happened to me about an hour ago. Were you charging your device at the time? I once reported real control issues to support that ended up filed under "We have no clue, and think you are minority case". Basically, when I am charging my iPhone 5c, I can completely lose control of direction, firing, consumables, ammo, or even the battle quick chat (lower right). Unplug my phone and things return to normal in about 12 seconds. Never had a problem with charging. Play with my iPad plugged in 99% of the time. 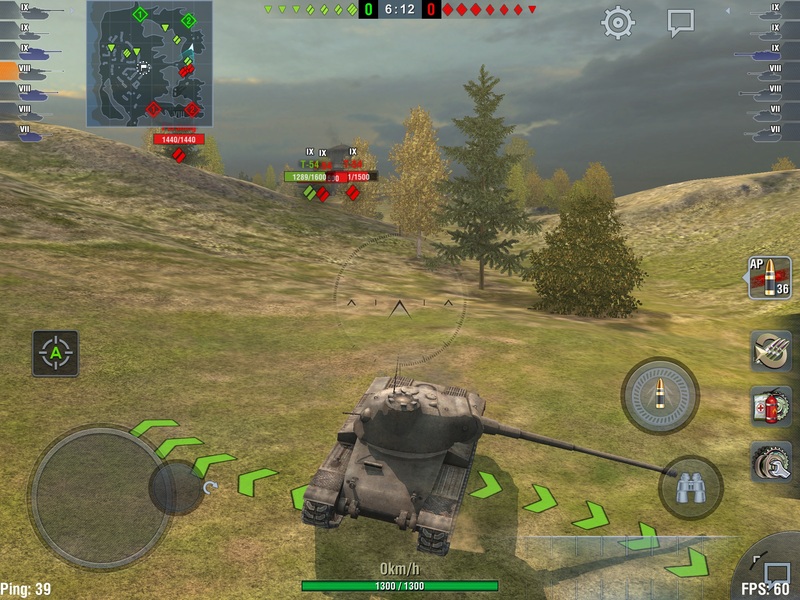 A later game my turret froze on the e-100. Never been shot. I could drive around fine, but turret kept pointing at lighthouse no matter what I did. Needless to say, I got rekt. Restarted my iPad and haven't had another problem, but still. That's just messed up. Oh, and in the indien, I could watch the battle progress normally while I did my pirouette. Clean the screen or turn the device upside down. IOW, play from the other side of the device. I can actually see my thumbprints embedded in the glass. Seriously, something is adding an input to your screen... food, dust, heat, hairball... something. I see it once in a while, where you can't drive, can't move, can't shoot ... due to some mystery lag or server lag that is NOT reported by the ping # in the bottom corner. My device is new, squeaky clean, no screen protector, no case, playing while charging 99% of the time. Upgraded to 10x faster internet. Still happens. Fortunately infrequently. This is interesting because I play often with my device charger plugged in. I will have to investigate this and see if the glitches are cut back. Tanks for this suggestion, I never thought of this. Yeah,,I've played 18 thousand battles with my iPad plugged in, so don't think its the charger. Notice in the indien photo, the thumb pad is registering my thumb, even though I wasn't touching it. The turret issue wasn't lag. I could drive around normally and the game progress was normal. Just the turret orientation could not be changed. The "quick check sweep" wasn't working, either. I'm guessing it was on my end, but I'm also thinking it was a glitch, rather than anything physical with my iPad screen.